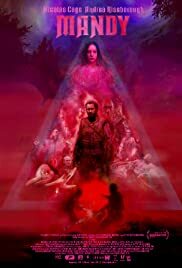 MANDY a futuristic horror is director Panos Cosmatos second feature after his ultra-pretentious futuristic drama that I absolutely hated THE BLACK RAINBOW. RAINBOW was exceptionally slow moving, like the beginning of MANDY as if the director wanted everyone to remember the comatose, rhyming with his last name. Panos is the son of Greek director George Pan Cosmatos, whose films I also generally dislike. His most successful film is one I hated THE CASSANDRA CROSSING that starred Sophia Loren. 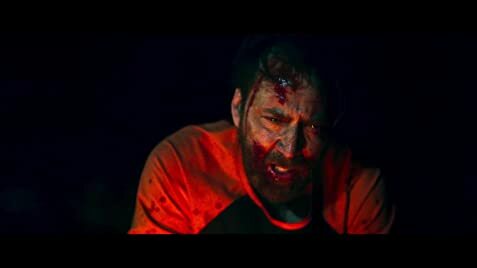 Panos Cosmatos reaches one step higher in MANDY that it has well-known actors Linus Roache (PRIEST, THE WINSLOW BOY) and Nicolas Cage. MANDY begins really slowly, so one must be fully attentive as it is easy to doze off. Consider the inane dialogue. “Are you ok?” “I am not ok.” “Is it my fault?” “it is totally your fault.” The dialogue goes on and on without making much sense. Cosmatos’ horror movie MANDY pals like an art house horror flick. Art and horror do not not go well together, as this exercise and Cosmatos’ devious film THE BLACK RAINBOW have proven. The film is set in at futuristic looking 1983. But this story is a little more steeped in demonic myth than microchips. Red Miller (Cage) lives with his enamored girlfriend, artist Mandy Bloom (Andrea Riseborough), in a cabin near the lake. Red works as a logger, while Mandy has a day job as a cashier at a nearby gas station in the woods. She creates elaborate fantasy art, and Red admires her work greatly. They lead a quiet and reclusive life, and their conversations and behaviour hint at a difficult past and psychological hardship. Red appears to be a recovering alcoholic, and Mandy recounts traumatic childhood experiences. The film shifts to a weird guy (Ned Dennehy) lying on a bed yelling at his mother , Mother Marene (Olwen Fouere) (with the inane dialogue above) followed by his brother assuring him “consider it done” to a request he has made. The film then follows Brother Swan as he tries to kidnap Mandy with the help of the Black Skulls, a demonic biker gang with a taste for human flesh and a viscous, highly potent form of LSD. Red Miller saves the day. Watch out for the duel the chainsaws. Cosmatos loves to play with visuals. A lot of his scenes are coloured bright red and accompanied with a thundering soundtrack like from an electric guitar. MANDY’s story is incredibly difficult to follow and really frustrate got try. Nicolas Cage appears only after nearly half the movie has transpired. Once he appears everything picks up. He is at one point stabbed with a sharp knife through his sides with a crazy woman yelling: “Now you will legalize the the cleansing power of fire.” Cage is so over the top, he adds the campiness that is seriously needed to life the film’s dreariness. MANDY is not for everyone and it is also safe it is not for many.